Among various software that extends functionality of the Zen Cart shopping cart there are modules and addons that help with store owners specific needs. Usually it takes time to browse over the Internet in search of the program, compare the prices, read the reviews. Its like puttinf pieces of a puzzle together in order to get a whole picture in the end. But what if you get the entire set of feature with one single software? That will let you manage multiple Zen Cart Stores using one admin panel, export and import different entities, make reports and manage discounts and many more? Store Manager for Zen Cart is an answer to this question. Its a complex online store management system that helps Zen Cart store owners with their most common every day tasks like complete management of products, categories, product attributes, manufacturers, recommended products, customers, orders, reports, locale configuration, direct database editing; offers Powerful Products/Categories Export/Import, Convenient Order Management, search and filters, add, edit and delete customers/orders , Advanced Reporting and more.If for example you want to set up multiple Zen Cart small stores instead of one large you'll appreciate Zen Cart Multiple stores management in Store Manager for Zen Cart. This feature allows to store your configuration data and quickly switch between Zen Cart stores. 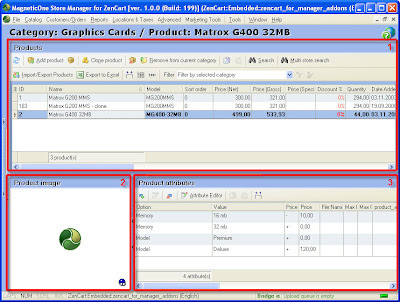 Zen Cart product management using the Store Manager for Zen Cart is made easy with the various tools that can be used to add or delete Zen Cart products. The number of products that you want to add in the database has no limit and this is a great advantage for those who have multiple Zen Cart stores. Different Zen Cart products can be merged into one Store Manager for Zen Cart so that you can streamline the inventory of the Zen Cart products into Zen Cart categories. Category management will be easier when using the Zen Cart especially for multiple Zen Cart owners. The Store Manager for Zen Cart provides tools to specify, modify and remove categories depending on the needs of your online business. The category trees can be parallelized with the folders that you use in your computer. This is a user friendly platform which is easy to use both for the customers and the online business owners. Just drag and drop items from Zen Cart categories! If you need to modify anything, you can edit, delete or add to the categories as necessary. Having categories to organize your Zen Cart products will help you save time and simplify shopping for your customers. 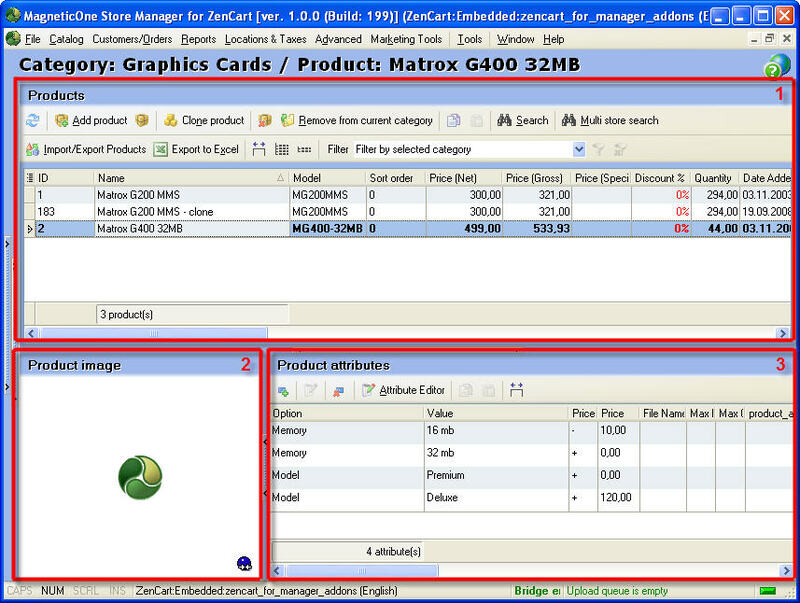 Product attributes are very significant in creating an inventory of the Zen Cart products. This way you can easily identify the products by their name, color, size, style, other details and even the pricing rates. This will help you during the search in case you are looking for a particular product when you are managing multiple Zen Carts. With the Zen Cart product attributes you are able to pinpoint specific products that you want to recommend in your customers, create reports and evaluations and study the whole online business that you are running because you are able to create rich data for a single or multiple Zen Carts.